Taking care of critters (farm animals) is easier than most people realize. Yes, it is work, but...everything needs work. However, there are animals that take less care than others. Choosing what is right for your area, time investment, financial situation are all factors in having farm critters. 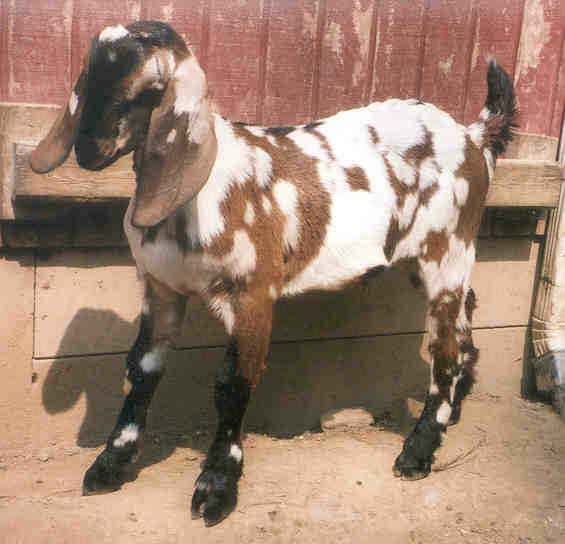 Having Nubian dairy goats and horses for over 20 years really gave me an idea of what I wanted and how I needed to spend my money, time, etc. At that time I also had chickens, geese, ducks and guineas--120+, and two horses--The General, a registered Plantation TN Walker, and Mercy, a registered Quarter horse. At present, I have downsized--no goats, horses and a lot less poultry--and plan to keep this small hobby farm simple and easy to run. BTW, the photo is one of my prized bucks. Uni (for Unique) was definitely gorgeous. Slideshow pictures include my registered Nubian dairy goat Naomi, Tag the wonderdog, Nubian dairy goat kid Nokomis, Plantation Tennessee Walker "The General," and Smokey the outside mouser. CHINESE GEESE are beautiful. 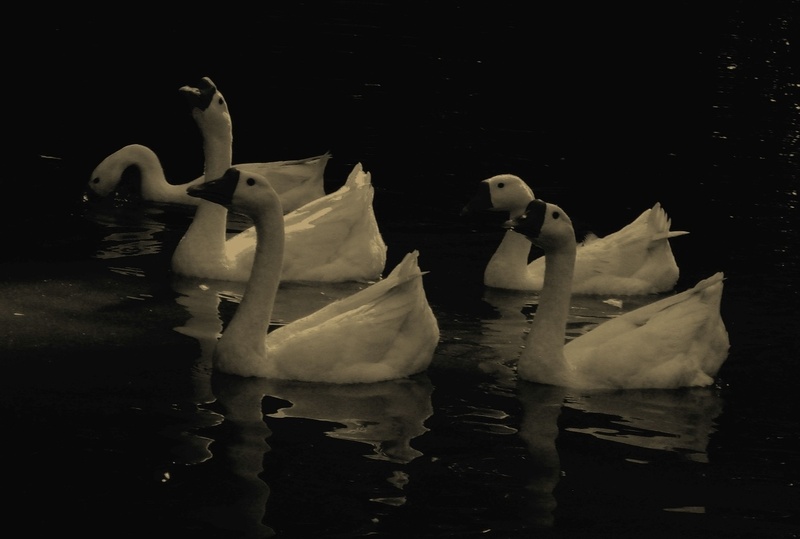 Many visitors think they are SWANS, so I just call them my COUNTRY SWANS. They are much less expensive than swans that cost around $800 pair. Geese are great weed-ers and watchdogs that honk quite loudly when intruders of any type venture on the property. They are easy care. In the case of Chinese geese, they need water, like a pond or creek. Just a note: some breeds can be mean. One of mine is and sneaks up and bites me from time to time. Let's take it critter by critter. I will give you the pluses and minuses as I learned them in 24+ years. You should also do more research. My notes are not exhaustive. Asking friends, neighbors and experienced animal breeders is a great idea. And, of course you always have the internet. Just a note about feed: GMO feed is dangerous for people and animals. Corn, soy, wheat and cottonseed are not good choices either. Please do some research on the type of feed for each animal you choose. GOATS: Goats take time and work. Price range varies from $20 to thousands. They need secure fencing to keep them in and predators out. Goats are escape artists. 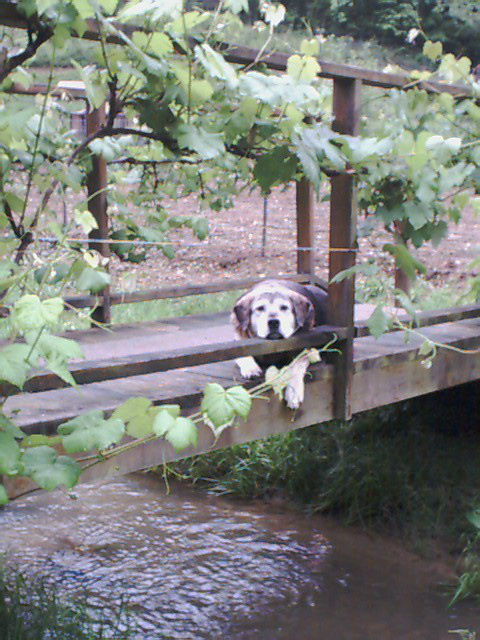 Many people obtain guard animals (dogs, donkeys, etc) for added protection. Good dry housing is a must. Ventilation with closing windows/shutters is recommended. They need feed (no GMO) and/or lots of pasture. They especially like weedy pasture. They are NOT grazers like cows and horses. 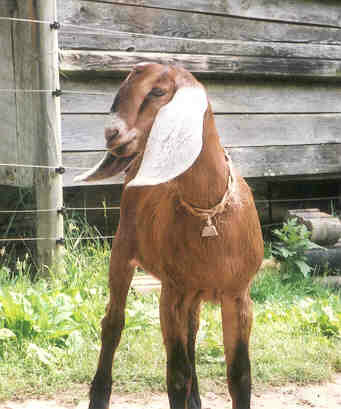 Goats are browsers. No matter what people say, goats don't eat everything and can be downright fussy. Hooves need to be trimmed at least every 6 weeks. A buck is needed or easy access to one for breeding to obtain milk. Remember, from this union comes kids. And, they multiply quickly. They love attention and don't like being the lone goat. They are herd animals. A lonely goat will yell and make you and the neighbors quite upset. A female (doe) in heat will scream also. If breeding, you will need a clean kidding area and milk room with stand. Bucks can run with does, but that is not always a good thing unless the buck is gentle. They can be territorial and dangerous. If a buck has its own housing, it should be clean, dry and fenced well. Bucks smell... During mating season, they perfume themselves with urine. Kidding season is a time to learn the ropes. Be sure to know about kids before breeding or purchasing goats...especially if you plan to breed. 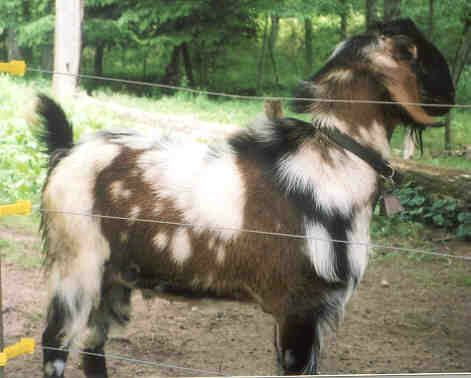 You can always purchase a wether, which is a neutered male goat. Goats are great at clearing out brush, but they also love tree bark. If not enclosed, they will eat your garden and yard plants. They do not eat everything like some say. They are picky. Discover what you are looking for in a goat. Some are for meat, meat and milk and milk only. Many folks use them for pulling carts or packing for hiking. It is suggested that you do a lot of research before you buy. Goats have wonderful milk--healthier than cow. However, you will find it a problem to make butter from their milk. You can make cheeses, yogurt, kefir, etc. They are friendly and love people. Children enjoy being around goats. They love to play like "kids." RABBITS: They need some time, but are less work. Inexpensive for common rabbit breeds. Rabbits are cute and they don't eat much. However, unless you are going to use them for meat (we raised them for our dogs' meals), pelts or selling, they will become pets. If you have a buck, you will have lots of pets. You will need secure cages, with the bottoms enclosed. Predators will grab the rabbit's feet through the wiring. Some folks fence in around the cages and cover the entire thing to keep out rain. If breeding, you will need a buck with his separate cage and boxes for the kittens (kits or baby rabbits). If you raise rabbits and goats, be sure to keep the rabbit feed away from the goat bucks. The alfalfa in rabbit food will cause kidney stones in the goat buck should they eat it. I lost two bucks before I discovered the problem. DUCKS/GEESE/GUINEAS: Easy care. Ducklings, goslings & guinea chicks are inexpensive. Ducks and geese can be destructive to a pond or creek. They will eat pond plants. Not all ducks or geese need a pond, but some type of water like a creek is helpful. Some geese can be mean and "pinch." They sometimes like to chase people or act aggressive. They eat grass and weeds. Supplemental feed can be black oil sunflower seeds, wild bird seed (without GMO corn), and oats mixed together. They are fun to have and will alert you to strangers or predators on the property. Guineas are loud. They call to each other and if a predator comes on the property, you will definitely hear their screams. However, like geese, they are very alert and super watchdogs. The female makes a "buckwheat" sound to call a male. Guinea hens usually end up killing their young by either drowning them in a creek or becoming a predator's meal when they nest in the woods. Over the years, I have had about 50 guineas. Between 4 and 6 is a good number. HORSES: Need care and cost is higher. The intial cost of a horse can run from the 100s to the 1000s. They need adequate housing, hay for food and bedding and good pasture. Farrier service (horseshoeing) is needed every 6-8 weeks. Tack--saddles, bridles, etc are needed. Grooming is important to keep the animals coat looking nice. Good fresh hay and clean water is a must. Supplemental feed is a very good idea, but this also needs to have no GMO corn, soy, etc. They need exercise--riding or lunging on a line. Secure fencing to keep them in and predators out. 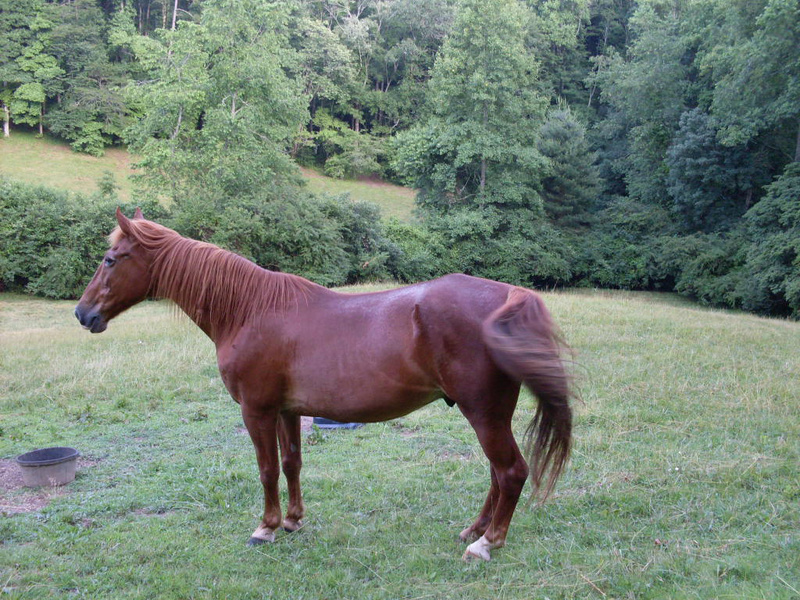 Bears, large wildcats and dogs have been known to attack horses. Floating of the teeth and cleaning of the male's "sheath" are important. CHICKENS: Easy care. Chicks are inexpensive. Choosing a breed is one of the fun parts of having chickens. If you select multiple types and try to hatch the eggs, you will have "FLCs" or funny-looking chickens. My preference: Brahmas, Buff Orpingtons, Black Australorp, Rocks breeds, Auracanas. Need very secure housing. Predators in my area include: dogs (even your own pet), wild cats, foxes, coyotes, wild dogs, weasels, minks, raccoons, opossums and hawks. Good food (free roaming with supplemental feed is best) and fresh water. No GMO corn, soy, etc for these critters either. They love grass. Chicks can be purchased rather inexpensively from mail order or local farms or feed stores in the spring and early summer. I do not care for mail order because I believe it stresses the chicks. I do not vaccinate. Choice of wire for housing and run should be considered carefully. Chicken wire does not last long. I have gone the extra expense and use 2" x 4" x 6' fencing for the day run and rabbit wire (1" x 1/2") for the housing needs around windows, doors, etc. Chickens are closed in at night because predators are on the prowl. Some wild critters like minks and weasels can get through very small openings. Be sure to keep this in mind. Also, don't forget to cover the top of your run with fencing. Hawks love chicken for lunch! Free-roaming chickens usually come in around dusk. At this time, be sure to check the cage for opossums, raccoons and other chicken killers that hide in nesting boxes or even sit on perches trying to pretend they are chickens. It's funny, but they will do this. Eggs and meat are the specialty of chicken raising. Eggs are gathered in the afternoon. Harvesting meat is not difficult. There are many videos online and books to show you this easy farm task. Many chickens lay eggs until the day they die of OLD AGE, which can be 6-8 years old. Yes, mine have lived that long. But, they are spoiled. You will need nesting boxes--about 1 for every 5 chickens. 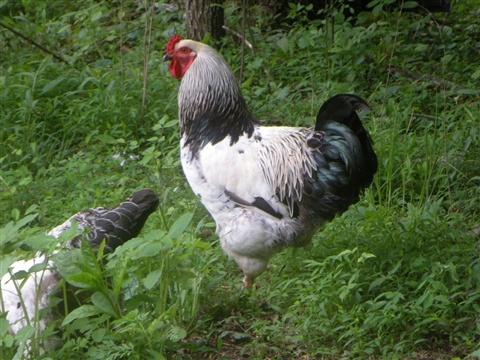 Roosters are not a must, but they do help give the hens the impetus to lay eggs. However, they do crow in the day and night. You need one rooster for every 10 hens. DOGS & CATS: Fun, helpful and easy care. There are lots of "pound puppies & kitties" that need a home. Cats are great mousers/ratters. I have 2 outdoor cats. They really do their job and they eat well, which is contrary to what people say about not feeding the cat and it will mouse better. I feed all of them dry Halo Spot's Stew for Cats. It's a little pricey, but I see the difference in their eyes and coats. In the winter, I supplement with wet food from Halo or other organic company. Dogs are great for watching farm critters, protecting the property and protecting the farmer and his/her family members. My dogs eat only homemade wet food and are supplemented with dry Halo Spot's Stew for Dogs. They get Halo vitamins/minerals for dogs & cats and mercola.com enzymes and probiotics. I worm them with ground, raw pumpkin seeds. Again, bright eyes and beautiful coats. Twice a week or every 10 days, they receive a small, raw burger patty with their regular food. Dogs eat raw meat in the wild, not cooked--the best being raw organ meats. 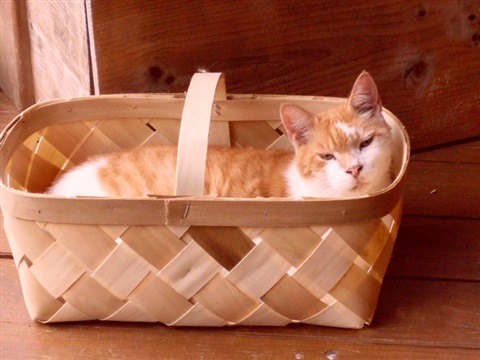 RECOMMENDED: Book - Natural Health for Dogs and Cats, By Dr. Pitcairn, 1995 edition. 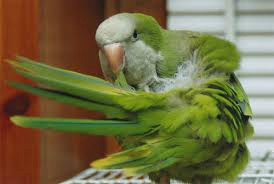 I have had parrots and other birds, but have decided they are too much work. Some parrots live a long time. My last quaker lived to be 33 years old! It was sad to watch him slowly grow old and die. No more birds for this chick. I've decided that poultry is enough work. As stated, these are just some of my farm observations. I hope you will do much research before taking on a farm animal. You will probably save yourself a lot of heartache and expense. I really enjoy the beauty, elegance and temperament of Brahma chickens. 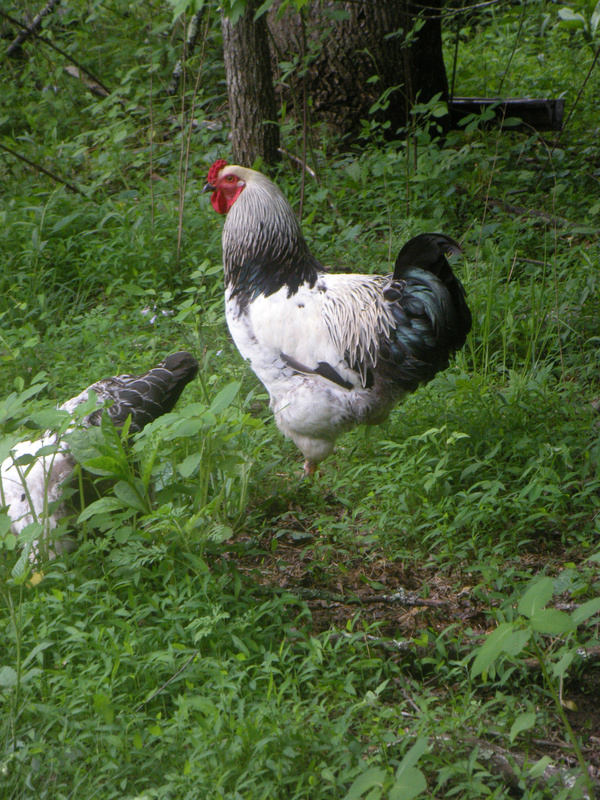 Brahmas are peaceful and good-natured chickens. The hens lay eggs all year and these birds are great for harvesting. They are large birds and supply plenty of delicious meat. This chicken tractor was built in VA by a friend, Lew Draper. 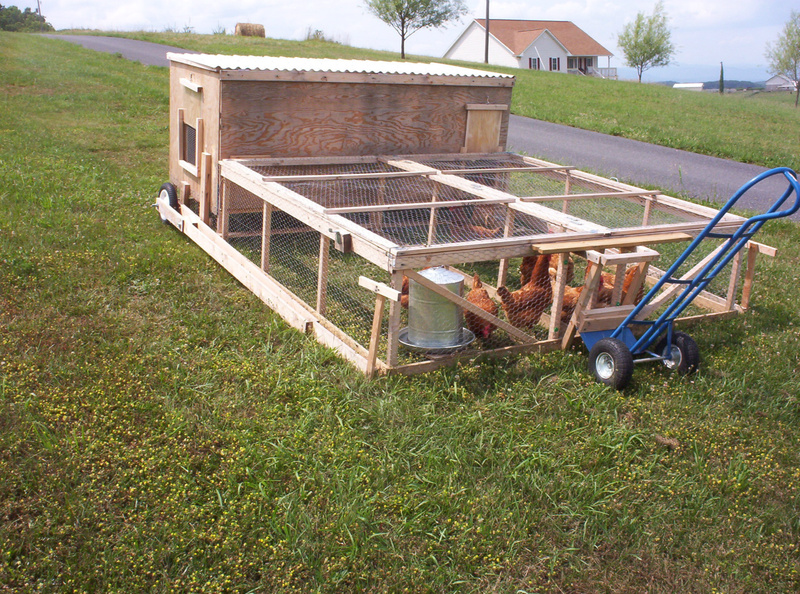 The plans are easy and it is another great way to raise chickens and fertilize your property at the same time. 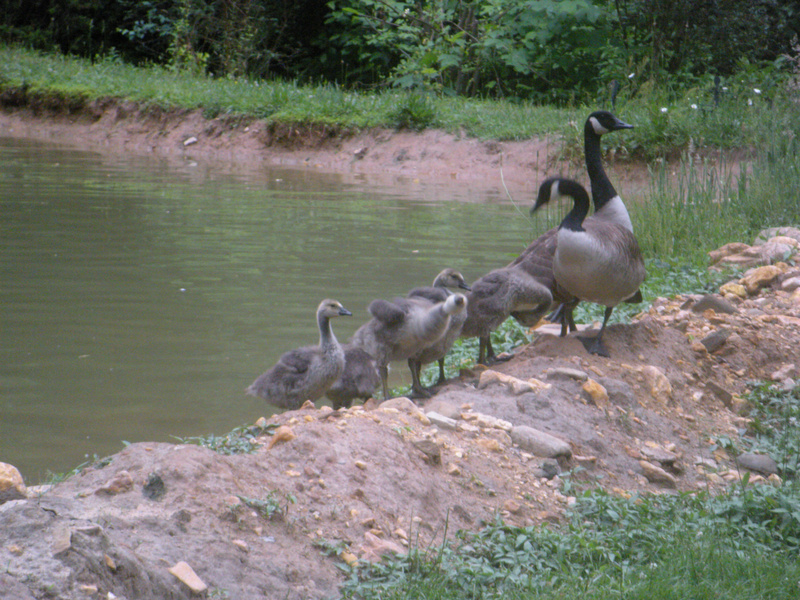 Canada geese and their goslings come to Tranquility Pond every year during cold winter months and early spring. Many times there are wild ducks as well. The geese usually raise their young and then fly away with them when the temperatures are warmer only to come again the next year. 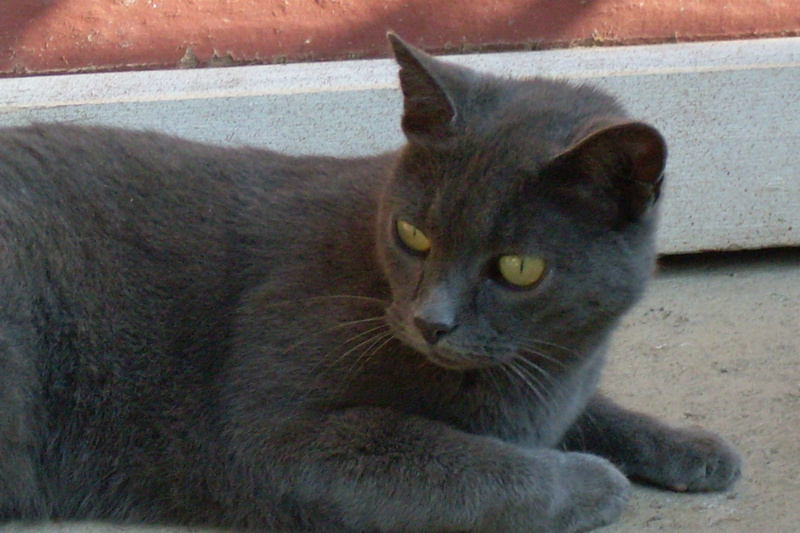 Sneaky passed away from feline Lyme's disease several years ago. He was a special cat who sneaked onto the property and impregnated one of our female kitties that was going to the vet that week. Sneaky was a super ratter! 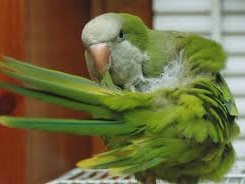 Dinghy was a talking-up-a-storm true parakeet, not a Budgie. He lived 33 years. Dinghy not only talked, but he could answer questions. He loved my dog Dui and enjoyed playing on the floor with him. He loved to yell "PRAISE THE LORD!!!" Breezy is new to the property. 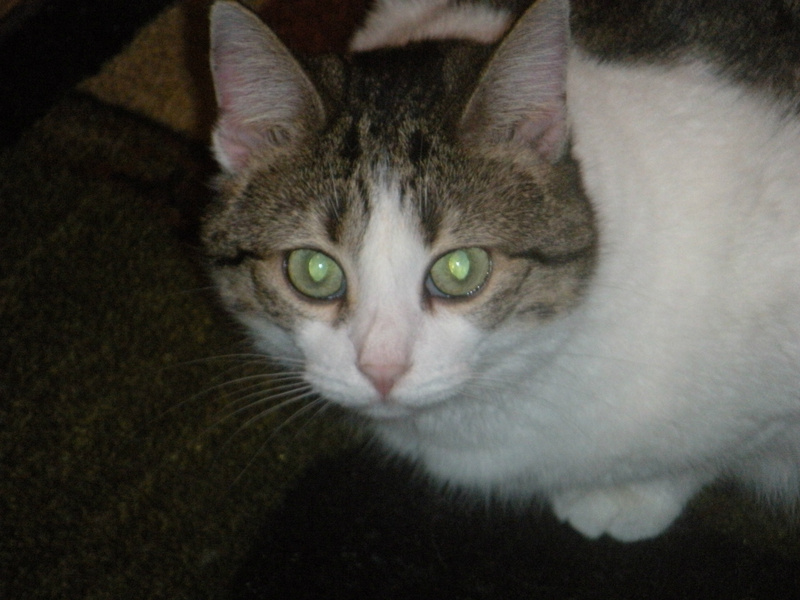 She is about 4 yrs old and loves to torment my other cat, Smokey, who is 18 and doesn't want anything to do with Breezy. Breeze is a super ratter/mouser. Her beautiful green eyes can spot a critter from great distances.